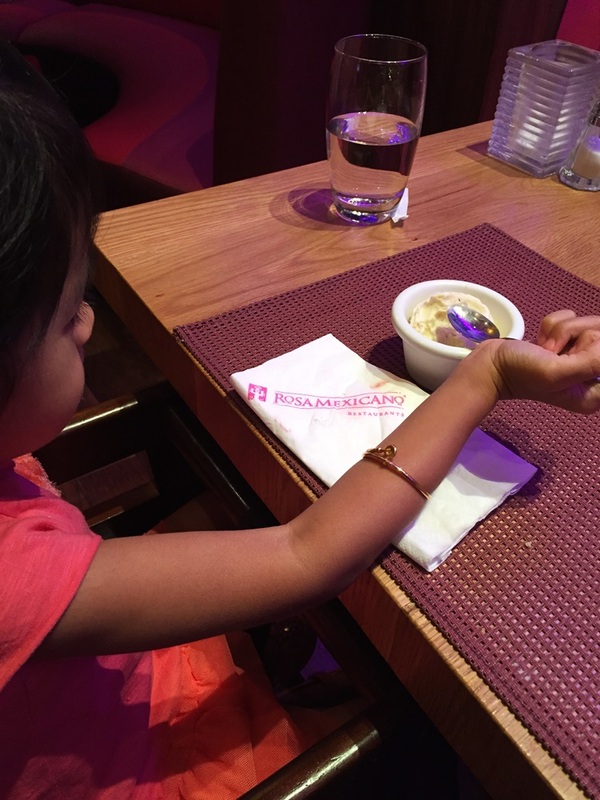 Earlier this month we were invited to dine at Rosa Mexicano’s Dubai Mall branch. Our knowledge of Mexican food is limited to guacamole and burritos. This is our second time dining at Rosa Mexicano and they definitely opened our taste buds to something more. We ordered a single serving of guacamole which is good for 2 to 3 persons, we had enough leftovers to feed another person. Among the three included in Tres Antojitos the best one for us are the empanadas. Our family is kind off addicted to liquor free margaritas and mojitos, Kuya V ordered another glass. We ordered Chicken Fingers with fries and mixed vegetables for LittleMiss from their Young Amigos selection, also includes a fruit juice and vanilla ice cream. Both kids were not given activity sheets to work on while we waited for food. They contended themselves by comparing the diving figures on their waterfall wall. LittleMiss’ food was delivered first along with our appetizer. Kuya V didn’t want to order from the kids menu, he had the crispy chicken which I think is the adult version of chicken fingers that was serve with green salad, rice and black beans. I had Salmon Con Jalapeno Caper, the fish was perfectly cooked and was seasoned well. All main dish are served with black beans and rice, we are not a fan of black beans and it was left untouched. I hope they give diners option to replace black beans with a salad. All three desserts were really good! 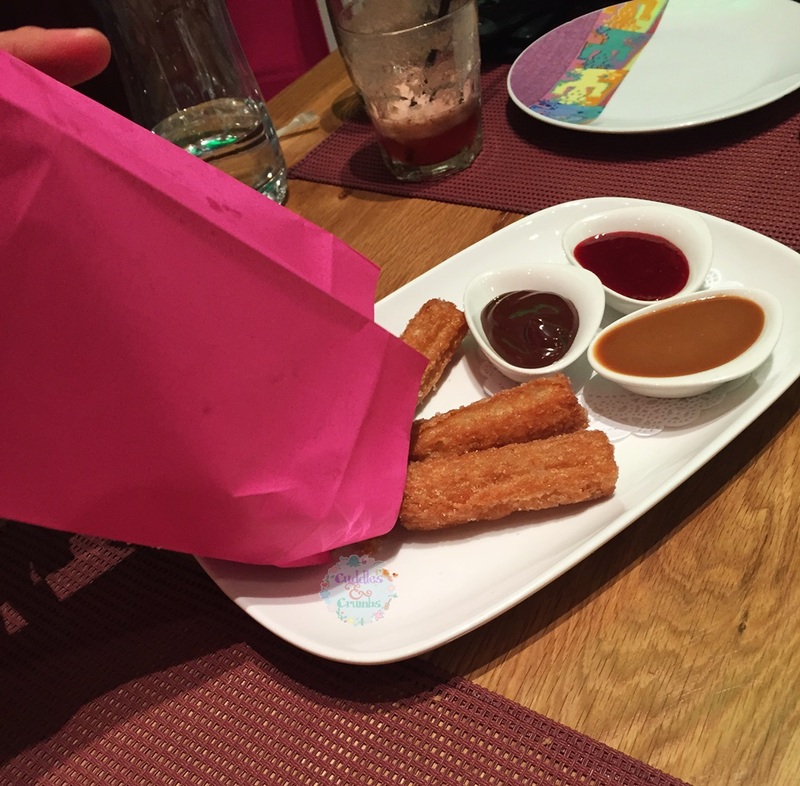 I could eat the churros by itself, hot sugar butter crunch outside and soft almost gooey inside. 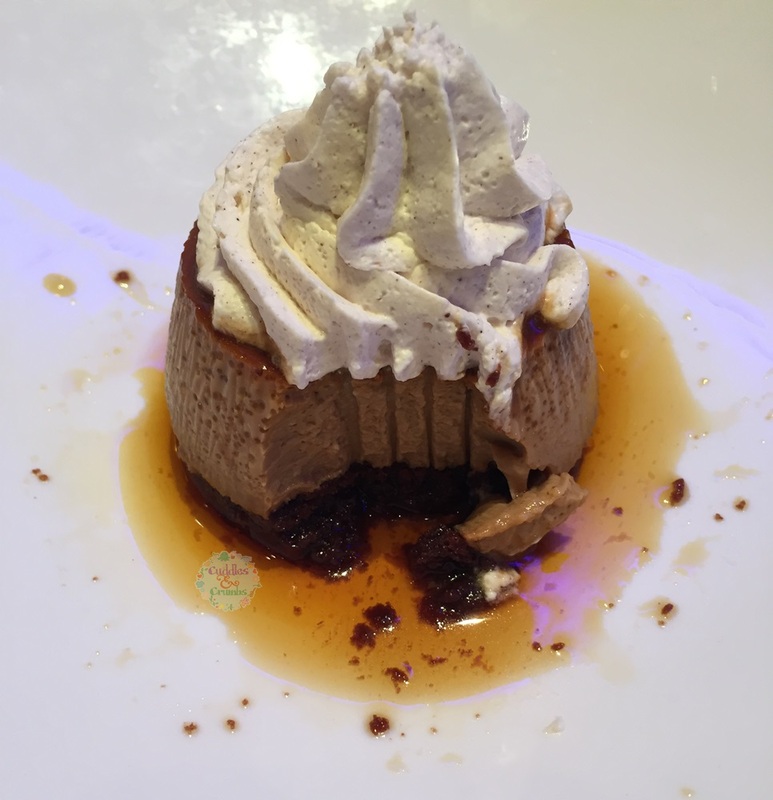 The Flan de Rosa had a strong coffee flavor that if I paired it with cup of coffee I’ll be awake all night, I just wish the brownie base was little bit thicker. You will find Rosa Mexicano at Dubai Mall and Mirdiff City Centre. Disclaimer: We were guest’s at Rosa Mexicano, but as always views and opinions are my own.